I'm right with you, buddy! LBR foster Katniss is always on duty to protect her family from squirrels. Momma and I are worn out after yesterday! We went to an event called the "Ruck-n-Roo 5k", a dog walk sponsored by a local greyhound rescue group. It benefited a group called H4 -- Hounds Helping Heroes Heal -- that helps provide service dogs to veterans with PTSD. Momma and I were raring to go! I made some new furiends right away. These lovely ladies are Duchess and Lexi. We hung out almost the whole walk. They were very lively! We had lots of fun on our walk, even though it was pretty cold and windy. Momma and I were pretty tired and worn out after we got back, and starting to feel pretty out of shape. Then they told us that they'd made a mistake when they were mapping out the course -- we walked 5 miles instead of 5 kilometers. No wonder we were tired! Afterwards we went and hung out on the patio at Chuy's, a Tex-Mex restaurant nearby. They were super-nice to all us pups. Momma brought my blankie out of the car to lay on, and since it was pretty cold Momma made me a boxer-burrito for a while. I didn't mind, because she kept sharing her tortilla chips! Guess who else was there? My good furiend and colleage, Dr. Shammy! He's an LBR alum like me, and we have impawtant medical conventions where we discuss squeakerectomies and stuffing surgery. I hope everyone had a grreat weekend too! Did you get in a good walkie like I did?? OMD, you guys, LBR's birthday Yappy Hour was a BIG success yesterday!! Remember we were gathering to celebrate LBR's 10th birthday last week, and our Pack Leader Auntie Sharon promised to take a cake in the face if we raised $10k in one day. And we DID! I know you're looking for me in that picture, but don't bother. Can you believe Momma left me at HOME?! She said that it was such a long drive, she had to do some errands on her way and I couldn't come into all of the stores. And guess what?? As SOON as she got there, some people came up to her all excited and asked if she was Casey's Mom. They said they read the blog EVERY DAY and couldn't wait to meet me. Momma didn't say so, but I think they cried when they found out I wasn't there. Poor things. So hi, Charley's Momma and Daddy!! I'll be sure to let you know the next event I'll be at. Okay, onto the caking!! Here's the cake Auntie Sharon picked out. Here she is before she got Caked. She was talking about how grreat LBR volunteers and fans are -- which they totally are, but we all know she was just trying to put off the Caking a bit longer! The volunteers drew straws to see who the lucky one was. Annnnnnnnd... CAKE!!!!!!! Woohoo!! Thanks for being a grreat sport, Auntie Sharon. I think you've never looked better! Oh, and even though I wasn't there, my buddy Taro helped out cleaning up the frosting afterward. Grreat job, buddy! Momma didn't totally furget about us, even though she cruelly left us at home. She came home with a couple of bags of home-made treats LBR volunteers made and even two antlers! And... a few other things. Momma managed to win TWO of the raffle drawings, so we got a TON of pawesome new toys, treats, and poop bags. BOL! Okay, Momma, I furgive you for not taking me. If you give me a few extra treats furst. Wow, our Mayoress Madi has another grreat event for Blogville today. 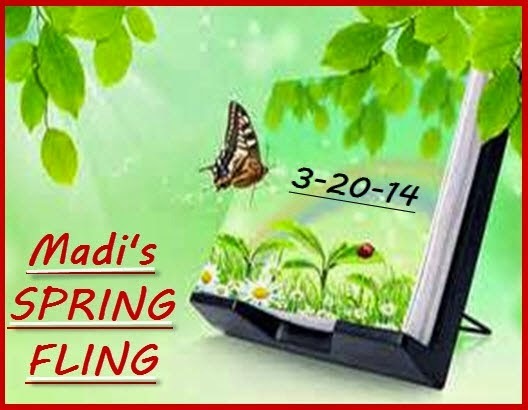 It's the SPRING FLING! Today is the furst day of spring, when a young dawg's fancy turns to thoughts of love. Today we're supposed to share a story about a date. Our furst date, our best date, or whatever fun story we have. So I have two pictures to share. Furst is a picture from my very furst Blogville date ever! 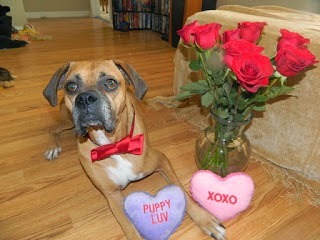 For the Valentine's dance in 2012, I was the lucky pup who won a date with Mayzie! I got all dressed up and treated her like a queen. We had SO much fun! Of course, I can't talk about dates without mentioning my beeYOUtiful girlfriend, Maggie Mae. Siiiiiigh, isn't she the most gawjuss thing you've ever seen?? 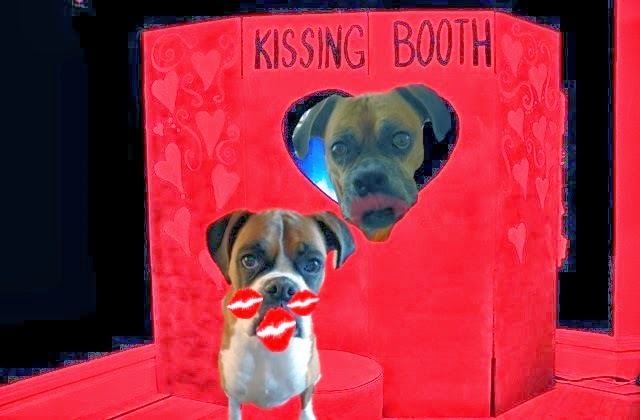 Our furst date was at this year's Queen of Hearts Dance, and I sort of lost control when Maggie Mae visited my kissing booth. Happy Spring, everybody! Maybe that groundhog will fall in love and leave us alone for a while, what do you think?? OMD, you guys, I just can't be wordless today! WE DID IT!!! LBR met our goal! We raised $11,168 in just 12 hours!! That's so exciting! Thank you to those of you who pawticipated in my comment-a-thon. Cinderella and I tossed in our treat money, so we contributed $50 to LBR! And as promised, I entered all the commenters' names into the randomizer. The winner of the fangtastic special prize is... The Idaho Pug Ranch Kids! Thanks for pawticipating, guys. 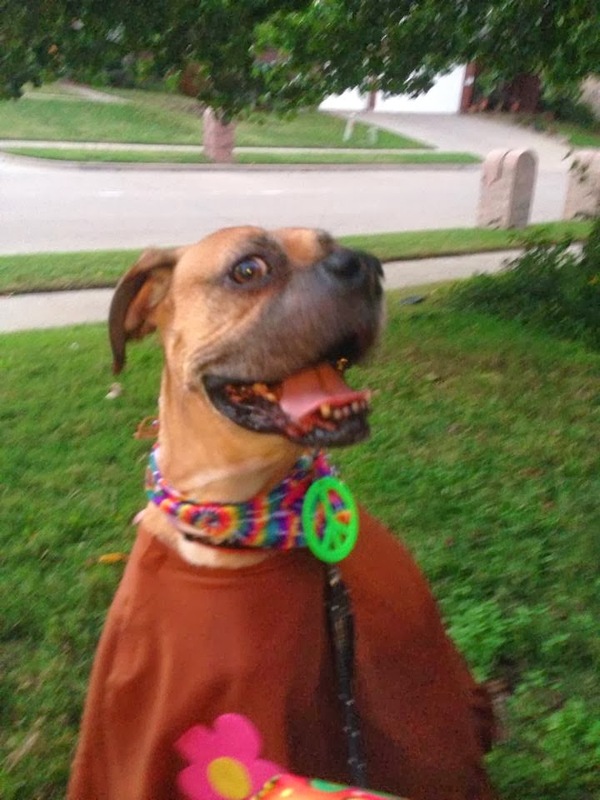 Today is the 10th birthday of the fangtastic Legacy Boxer Rescue, the rescue that saved me, my sissy Cinderella, and over 2500 other boxers in the North Texas area over the past decade. WOW!! Can you believe it?? I can never thank LBR enough for all they did to save me from a hot, miserable death as I languished outside in a Texas summer, sick and unloved. You can read my whole rescue story here. My sissy Cinderella was in just as bad shape. She was saved from a shelter just after having puppies, sick with heartworms and losing most of her fur. Read about her condition here. 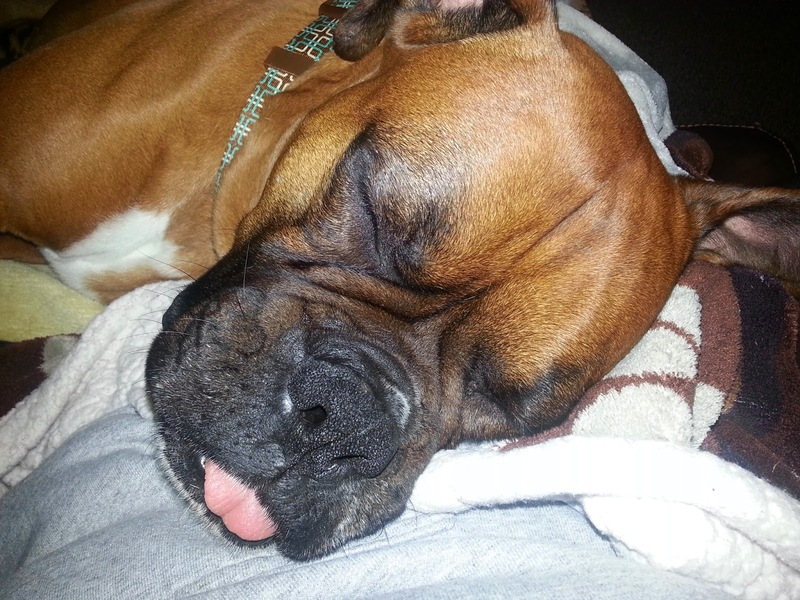 So many other boxers owe their lives to LBR.Take a look back at some of our pups we've featured here on the Chronicles, like the Spice Pups, Patches, the Parvo Princesses, Obie and Pancake, Napoli, Falkor, Calypso, Gummi Bear, Nala and Bruno, Baby Austin, Coco, Wall-E and Marty, Homer, Lucca, Charity, Roarke, Alouette, Mercy, and all my foster siblings! Momma, Cinderella, and I just can't express how proud we are to be part of this organization. Today LBR is running a massive Facebook event, so be sure to check out all of our posts and activities there! We're also running a fundraising event for our birthday. We're asking all our fans to donate just $10. That's not much for just one person, but if all our fans contribute, that's a HUGE amount to help the dogs! Our goal is to raise $10,000 in one day. Please go here to donate to LBR! (Or just Paypal your donations to info at savetheboxers dot com!) Edit: We have a special birthday donation link set up! The Legacy Chronicles is having our own event today too! For every comment left on today's post (as of 8pm Central time tonight), Momma is going to donate $1 to LBR's birthday fund. And every commenter will be entered into a fangtastic prize drawing. I'll announce the winner on tomorrow's post! 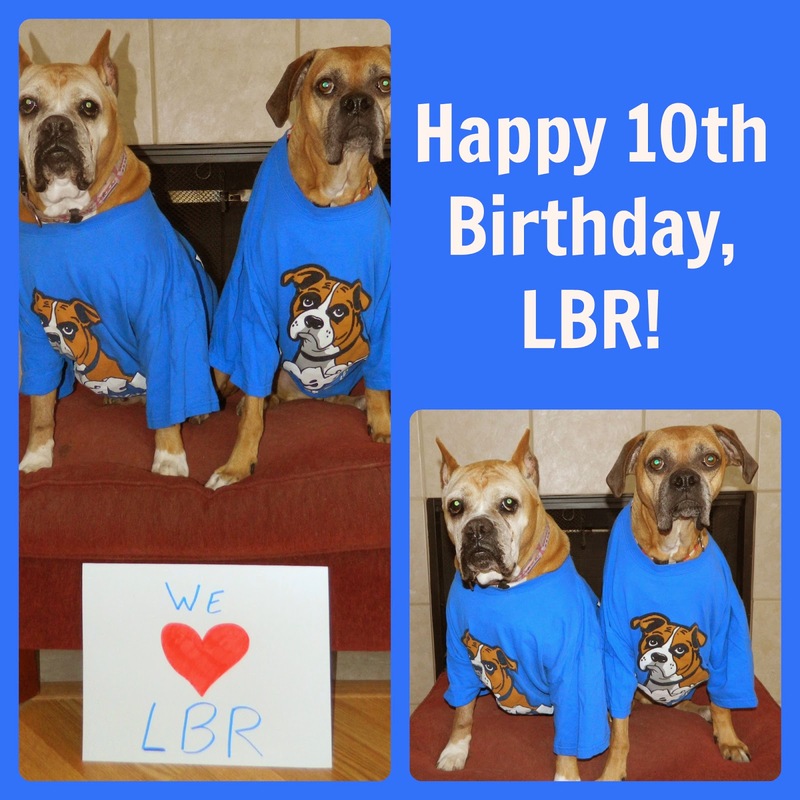 So please comment, and please visit LBR's Facebook page to wish us a happy birthday. Here's to 10 more years of saving boxers!!! Luck o' the Irish to ye! And a very happy St. Patrick's Day to all! PeeS: Don't furget tomorrow is my bigg comment-a-thon for LBR's 10th Birthday pawty! Be sure to come by! Yesterday I asked everyone the question, "Who's that blur?" Most of you thought it was me. FOOLED YOU!!! Everybody say hello to DUFFMAN! Wait, wait, Momma, that's the wrong picture! Sheesh, good help is SO hard to find. Let's try that again. 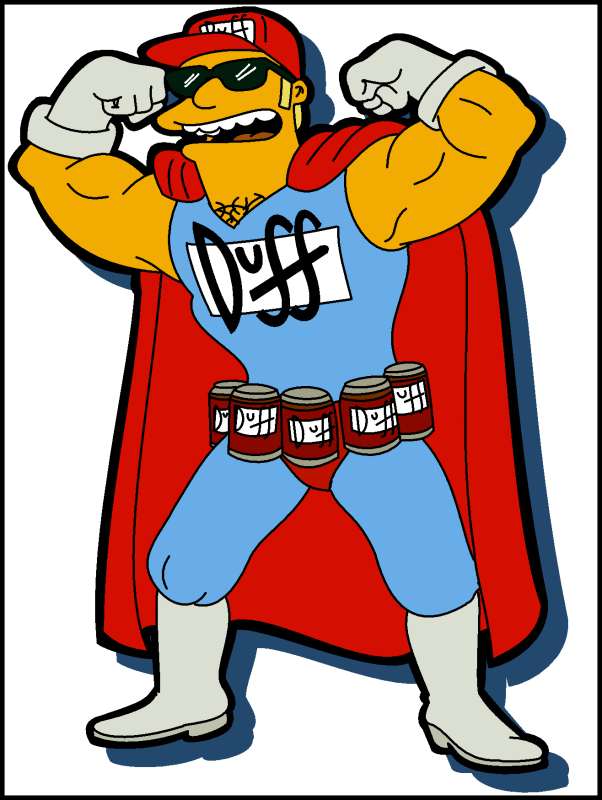 Say hello to DUFFMAN! Duff is an LBR foster dog. Isn't he super-duper handsome. Momma loves his squishy face. His foster family went away for Spring Break, so he's hanging out with us for the week instead. "Who needs a silly vacation when I've got a Caseycation?!" We're having lots and lots of fun together. He's sooooo friendly. We were buds right away, and he's even nice to the kitties. That's hard, especially with my kitties. BOL! We like to chase each other around the backyard. Now I'm the blur. BOL! "Hurry up, I've got places to sniff and peemail to leave!" "Enough with the introductions already! It's naptime!" Wordless Wednesday: Who's that blur? 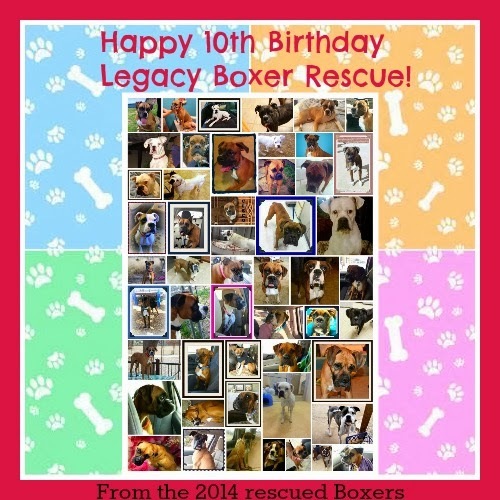 In just one week, Legacy Boxer Rescue turns 10 years old!! 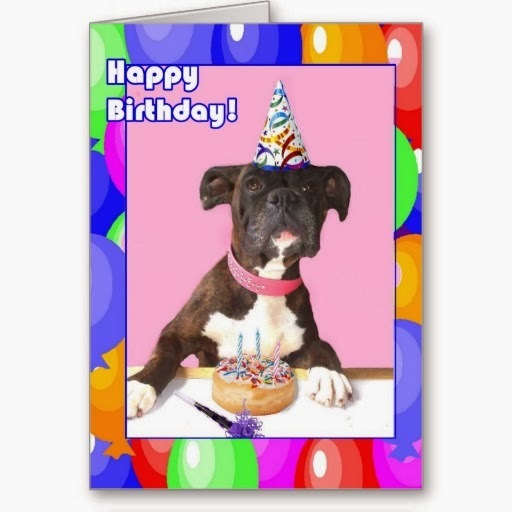 We were officially formed on March 18, 2004, and we've saved more than 2500 boxers in the North Texas area since. LBR is going to be celebrating with a HUGE blow-out pawty. We'll be having a big event on Facebook, posting stories about LBR's history all day and running a donation marathon. We're encouraging our supporters to donate just $10 each, with a goal of raising $10,000 over the day. It's a big goal, but we can DO it!! I've been thinking about what I can do here on the Legacy Chronicles, and I've decided to hold a comment-a-thon! For every comment on my March 18th post, Momma will donate $1 to LBR. AND everyone who leaves a comment will be entered in a drawing for a fangtastic prize that I'll announce on Wednesday the 19th! How cool is that? So warm up your typing paws and get ready for a pawty on March 18th. Woohoo! Do you know what happened on March 18, 2004? No?? It was HUGE day for the boxers of Texas. 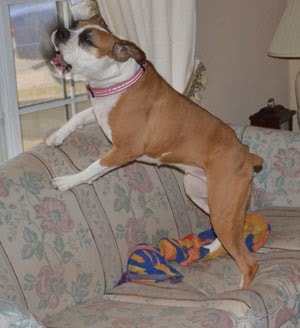 That's the day Legacy Boxer Rescue was officially formed!! That means we're coming up on our tenth birthday in just over a week. WOW! 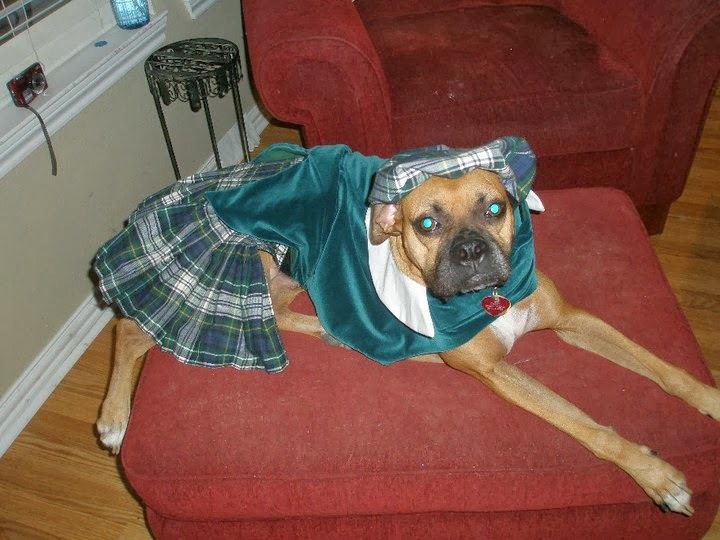 626 boxers adopted from 2004-2007. 204 adopted/in foster care 2014. 2,530 Total to date. That's over 2,500 boxers saved in 10 years. Way to go, Team LBR!!! LBR is going to be pawtying hard for our birthday. Stay tuned for more information about our birthday bash on Facebook and right here on this blog. We're going to be encouraging all our supporters to donate $10 each, with a goal of raising $10,000 on March 18th. It's a big goal, but we can do it!! It's LBR foster Penny vs LBR alum Carter in the Battle of the Century. 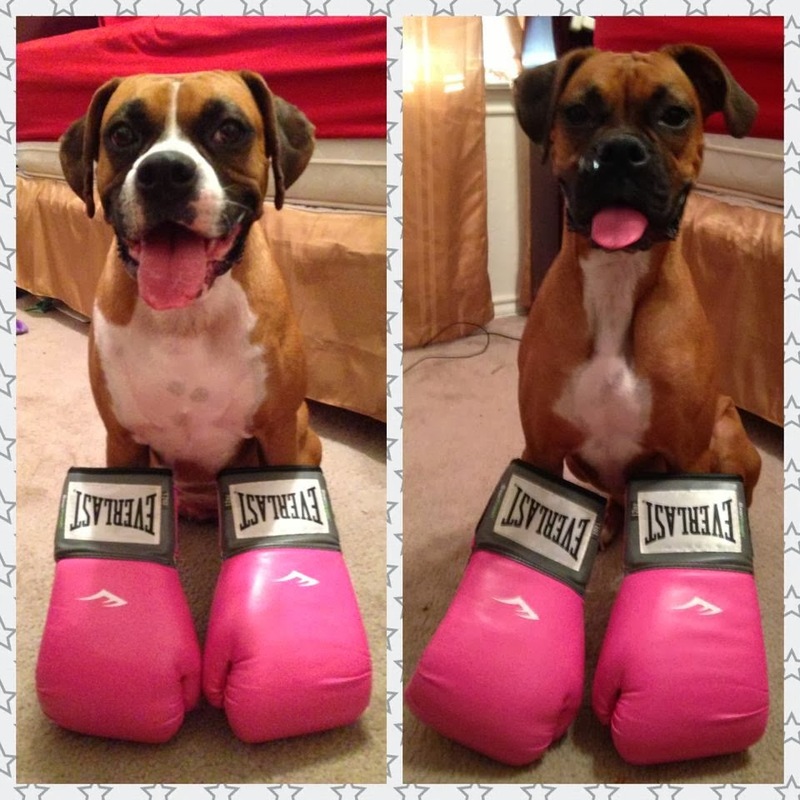 Who's the better boxer? I say they BOTH get cookies, how about you? Okay, I know you can't figure it out, so I'll tell you. Surprise, I actually did TWO things!! The first thing was on Saturday, when Momma and I went down into Dallas for the North Texas Irish Festival! This is a pawesome annual event, and Momma's always talked about bringing me along, but she never did. But this year's theme was "Erin Go Bark", and they really went all out with dog themes and rescue groups. So I told Momma I HAD to go. I had just the outfit to wear! It was a beeYOUtiful day. Sunny and highs in the 70s! Momma and I had so much fun wandering around, listening to the live music and looking at the vendor booths. I also got to meet my good buddy and fellow LBR alum, Shamrock! Shammy is well-known to LBR's Facebook fans as Dr. Shammy, Medicine Boxer. He's almost as good at dressing up as I am. This is Shammy with his momma, Auntie Debra. I also got to meet a cute little Corgi who had a kilt like mine! The same place made it as mine, Castle Canine Creations. They made his to match his daddy's kilt. How cool! Phew, what an exhausting day!! I napped hard all night, because I knew Sunday would be even more action. Momma and I were heading down to the McKinney town square for the annual Krewe of Barkus! This is a Mardi Gras celebration for the dogs. There's a costume contest and doggy parade around the town square, where pawticipants throw out beads, candy, and dog treats. There's a different theme every year, and this year's was "Barkus Goes Back in Time: A Salute to the Doggone Good Decades 1950s - 1980s". So Momma and I were hippies! We almost didn't go, because that 70 degree weather suddenly turned into upper 20s, and it was sleeting!! But Barkus let us know that they were moving things indoors to a nearby location, so we went and had fun. It was close quarters, but I like being everybody's furiend! I hope you had a grreat weekend too. Peace out!